If you recall, Older Daughter just turned 19. She's been a model kid -- respectful, helpful, not given to angst and drama. It's the same thing with Younger Daughter (age 16) -- no angst or drama, lots of respect. We definitely lucked out in the kid department. Adolescence is always a dicey prospect for any parent. I've known kids with lousy parents who turned out great, and I've known kids of terrific parents who were anything from a handful (at one end of the spectrum) to horrible (at the other hand). Teenage rebellion is always tough, but eventually it's up to the teens themselves to decide whether to straighten out by the time they're adults (as most do) or whether to embark on a lifetime of bad choices and rotten behavior that will affect them (and their own children) for decades. 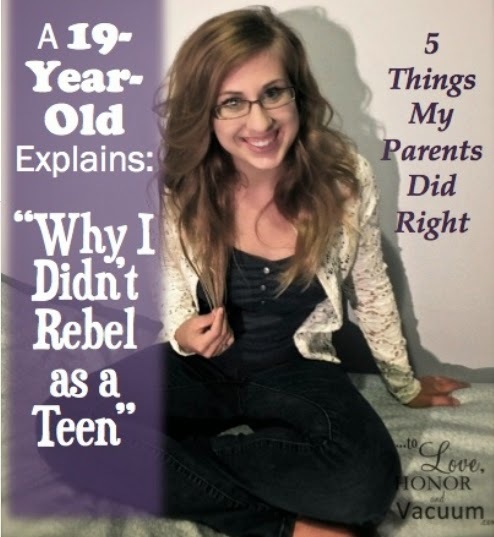 There is no cut-and-dried formula to get kids through their teenage years without rebellion. Variables include the personality of the child, religious influences, schooling methods, and of course parenting strategies. There is absolutely no one-size-fits-all approach that works for everyone. But recently I found a fascinating column in which a mother asked her 19 year old daughter to articulate just why she didn't rebel. In response, the daughter wrote an astoundingly insightful essay (they're Canadian, hence the slight variation in spelling). While this young lady's explanation won't guarantee a home free from rebellion and strife, I found her insight fascinating. Well worth reading. Very interesting. My parents followed all the same ideals for the most part, and I still rebelled as a teen (although I was closer to 20 at the time, but still living at home). I think the "encouraging" vs. "demanding" is an extremely important part of how parents can communicate with their children. My parents were more on the "demanding" side and I feel that may have had a part in my rebellion. Talking about everything is HUGE. Maybe the biggest thing you can do-- bigger than rules, bigger than expectations, bigger maybe than ANYTHING. I DID NOT have an ideal family situation. It wasn't bad, but it certainly wasn't ideal. My parents split up when I was a toddler. For four years, I lived with my mom's parents and saw my dad on weekends and my mom a few evenings a week. Then I lived with my mom until she died and saw my dad on weekends. Then it was Daddy and me; he worked 60-hour weeks in the mines and I was on my own until late in the evening and all day most Saturdays. Nor were ANY of us what you think of when you think of a "good Christian family." My mother, frankly, had a hard time keeping her pants up. My grandparents were active church members, but struggled constantly with mental illness. My dad-- Well, if the boys from Duck Dynasty and Joan Baez had a love child, that child would have been my dad. Still, I wasn't terribly rebellious. I was outspoken and opinionated, but never inclined to want to get into trouble. Had I not become desperate to "fit in with the world" at 17, I wouldn't have made ANY of the traditional Stupid Teenager Mistakes. I'm sure that the reason is that, from the time I could talk, I was treated as if I were intelligent (if lacking wisdom and experience). I knew I was important to the family; I knew I had an influence and a stake in how things turned out. I had a voice in how our home was structured and run; if I was going to rebel against it, it was pretty clear that what I would accomplish was biting off my own nose to spite my face. I did do some really stupid things in the name of "being normal." I regret those things, though I did have the foundation to drag myself out of it and turn myself around. I also remember knowing, even at the time, that I owed my father better than the stupid crap I was pulling. Despite our best efforts, my son and I did not speak a civil word between 16 and 18 when he went into the Navy two weeks after his HS graduation. I am 100% positive he did so to get away from me. As time went by and his own children came along I observed that he was even more strict, demanding, encouraging, expectant than me. I almost pitied my grandkids. Well, here we are 28 years later and he and I joke about it. He turned out to be one of the best people I know. Who would have figured? We are on the edge of this period with two of Na Clann. I think one thing that has helped immeasurably is staying involved with their lives - volunteering for what they do, knowing their friends. Something else I have tried is knowing when to speak and and when to observe - in a sense like with my adult friends, based on what the nature of the issue is being faced. My 2 sons didn't rebel, though I was a single mom, and feared that they would. I always thought the main ingredients were a great deal of mutual love and respect, and alot of sports!! I wasn't raised in church, but my kids and I shared our thoughts about God, Church,,,and puzzled over bible scripture together, Now 2 of us are Christian and pray diligently for the son still out there! I tend to agree with you - when it comes to parenting, there is no "formula" that will guarantee results. I can tell you what I think contributed to my own rebellion, though. Inconsistency and instability at home, perceived hypocrisy in my parental units, negligence and inattentiveness especially in my younger years. It always rubbed me the wrong way that my parents only started getting their own acts together when I was in the middle of my adolescence and then expected me to toe the line and to not follow the example they had set me in all the previous years. She brings up some really good points. I wasn't a rebel growing up either. I believe it's because of the reasons she gave. I was "a rebel without a pause" from about age 5 until...uhmmmm...maybe now? LOL! I was an absolute rebel as a teenager. I did EVERYTHING a teenage rebel can and will do. I'm 58 now, and a homesteader/farmer/crafter/whatever I need to be. 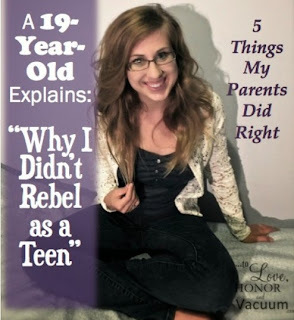 I lived through my teenage rebellion years (as most do) and out of my 7, I don't think any of my kids really rebelled. They never shocked me...I had done worse. I could talk to them about my own teenage screw ups....and let them know that no matter how badly they screwed up, I'd still be there for them. Don't *knock* the rebellious kids. Some of us turn out okay...or close to it, lol! I loved the blog link! Interesting and insightful perspective. I also think it's possible to 'funnel' rebellion. That rebellious personality may turn out to be innovative and inventive, throwing convention out the window and finding cures, answers or inventions because they didn't follow the expected rules or order. Having a supportive family or network that encourages that might be the difference between breaking the laws & going to jail, versus breaking conventions and creating something amazing! Too often we are afraid of something that doesn't perfectly fit the norm, instead of encouraging healthy outlets. P.S - I just read an article saying about how the Post-It note creator broke all sorts of rules at work in creating it. Anyway, Happy New Year and Best wishes to you and your family!